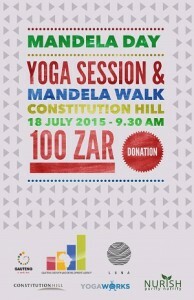 Join Yoga Works and the team from Constitution Hill on Mandela Day for a great morning of healthy exercise, history and culture, and giving back to the community. Steven from Yoga Works will guide you through 27 yoga poses (one for each year Madiba spent in prison) and each pose will be held for 67 seconds. Afterwards the guides from Constitution Hill will take participants on a 67 minute Mandela walk around their historical site.